A common approach to modeling data driven marketing campaign responses is to try to estimate the probability of getting a response based on your predictor variables. This technique generally uses a procedure called logistic regression. This approach can take into account both categorical and measurement data. When such a model is applied to a given audience, the result is that each consumer is given a response score. Typically, this is a number between 0 and 1 and purports to measure the likelihood of that customer responding to your campaign. These response scores don’t really resemble actually probabilities at all. In other words, if you just mail to people with response scores above .9, you’re not going to get a 90 percent response rate. The important thing about them is that higher scores should be associated with higher response rates. In other words, these scores are a good sorting tool. This brings back the notion of a gains chart. When you test your model against your validation group and again when you actually implement it, gains charts are a very easy way to visualize how the model is performing. The idea is simple. You sort your audience by response score from highest to lowest. Then graph the percentage of total responses against the percentage of customers above each score level. The model scores are represented along the bottom. These are the percentile ranks of the model scores. The leftmost 10 percent represents the top 10 percent of model scores. 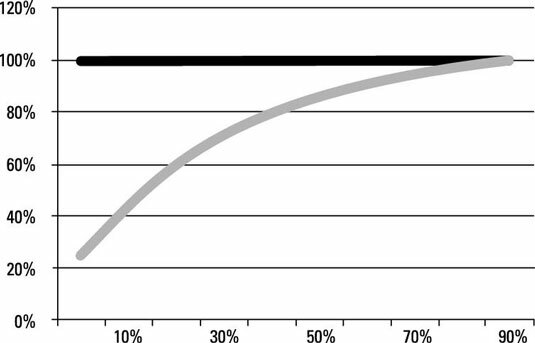 The vertical axis represents the percentage of responses that came from customers whose score exceeded a given percentile rank. For example, this graph is telling you that approximately 70 percent of responders came from the highest 30 percent of model scores. When using a gains chart to evaluate a model, you’re looking, qualitatively at least, for only one thing. You want it to be steep. The faster your total response percentage gets up close to 100 percent, the fewer customers you had to contact to get those responses. A common application of the information provided in a gains chart relates to sizing your audience for a campaign. When it comes time to select a target audience using your model, you can use the gains chart to figure out how many customers to mail to. Gains charts are a powerful way of visualizing the targeting efficiency that models can provide.